Home > Award > And the winner is…The Dog Walker! And the winner is…The Dog Walker! 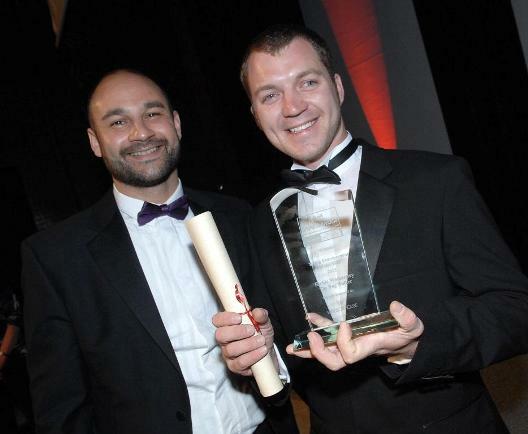 Richie Womersley, managing director of The Dog Walker, was crowned Young Entrepreneur of the Year 2013 at the Ackrill Media Group Business Awards. Richie fought off tough competition to come top of his category at the prestigious awards ceremony that scours Harrogate and district for the best business talent. Richie was highlighted for his resilience, entrepreneurship and potential to succeed at the gala dinner which was held of the Harrogate International Centre. Richie, 30, founded the business in 2006 because he believed animals deserve better care than they receive in kennels. This passion continues to drive the business forward. Richie has grown the business to be Yorkshire’s largest pet care and well-being specialist employing eleven people with six franchises. The company provides fully insured and registered care for customers’ pets in the stress-free environment of their own home. “I am so thrilled to be an award-winning business and to be recognised for all our hard work in growing the business. Richie Womersley (right), managing director of The Dog Walker, accepting his award from Paul Smith of award sponsor Windsor House.